Also available on a shirt! Combining the classically recognizable Uncle Sam “I Want You” poster with the popularity of The Lord of the Rings, this idea came about a few years ago when my friends Claire and Megan were putting together a local magazine. I decided to do a humorous piece touching on the fact that if you were in the least bit aware of the situation of Middle Earth, you would probably not join the losing side. But well, either orcs can’t read or just don’t care, because a huge number of them threw away their lives in the war. 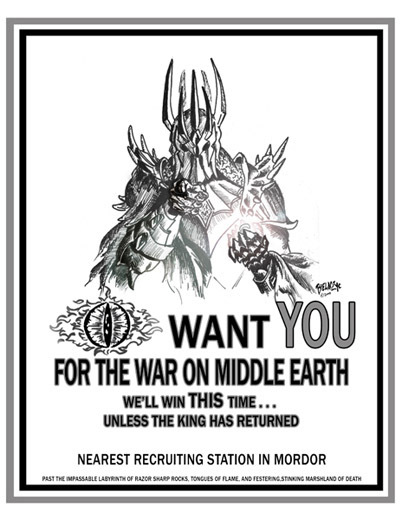 And so honestly, if you see this recruiting poster, and still want to join the fight against the forces of good, well, you just aren’t very bright. Every line of the poster reminds you how badly this all went last time. As I kept writing, I kept coming up with more witty lines. Though once I reached 10 pt font, I decided it was time to cut off the jokes.